This has been an extremely busy month for me - but I guess that's par for the course. I've had to run my grandson to appointments with his pediatrician, neurologist, neurosurgeon, occupational therapy, GI specialist and ENT specialist (I may be leaving something out) on top of his having to spend 24 hours in the hospital for multiple procedures at one point. The good news is we now have a clearer idea what's causing his issues, and it seems these can be treated non-invasively. I've also had several readings: 8/4 I hosted Monday at Mahall's in Lakewood. 8/5 I featured at Your Vine or Mine in Painesville. 8/15 I read at Voices from the Viaduct in Erie. 8/25 I attended Crisis Chronicles Press author Leah Mueller's reading in Canton. And 8/27 we had our Oct Tongue -1 book launch at Mac's Backs in Cleveland Heights. It's Crisis Chronicles' biggest book to date (by seven authors: Mary Weems, John Swain, Steven Smith, Lady, Shelley Chernin, Steve Brightman and myself), and getting it published in time for the event took up a lot of the first half of the month for me. I've also been preparing for future events, including 9/1's Monday at Mahall's featuring Ray McNiece and Mary Weems. I finally have the Mahall's lineup finalized through the end of December, and I'm really excited about it (more on that in a later post). August also saw the official release of another big Crisis Chronicles Press book: The Night Market (poetry by D.R. Wagner with art by ReBecca Gozion). I'm really proud of both of these books. The Night Market took about a year and a half to publish. Oct Tongue -1 took nearly a year. But both are well worth the wait. I'm currently working on half a dozen other great books that are behind schedule (more on those in a future post). And then I've had some minor car trouble. I took my car in for an oil change and found out I had a nail in my tire and needed some kind of air filter replaced. Then somebody walking down the street bashed my windshield with a hunk of black top. Altogether, there went another $300. I've only had the car slightly over a year and I've already had to invest nearly $2000 in repairs - something I had hoped to avoid when I got rid of my 1993 Buick for a 2013 Mustang. And then, back to August, there's my on again off again job search, assorted other family needs, and I could go on and on. The good news is I keep plugging away. I owe you work or an email I will get to it as soon as I can. Don't give up on me. Like seven 31-page chapbooks in one! 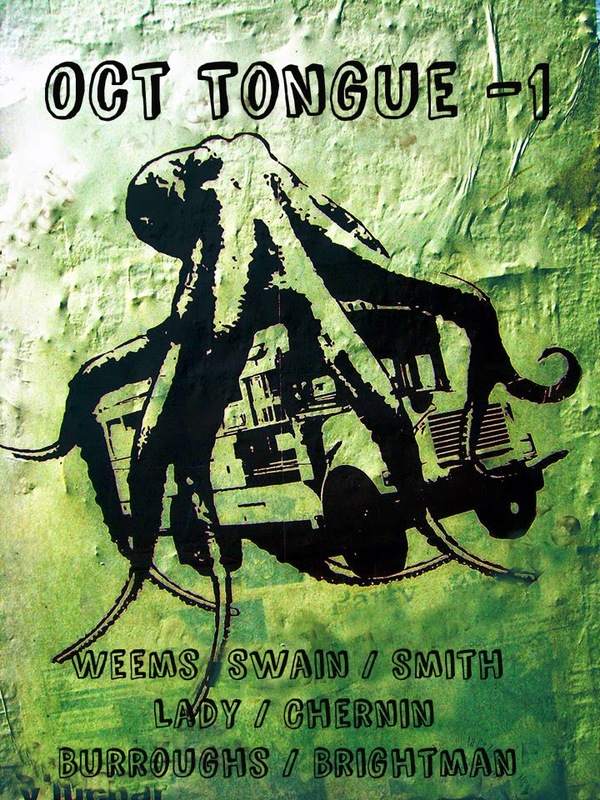 Published August 27th by Crisis Chronicles Press, Oct Tongue -1 is a collaborative book by Mary Weems, John Swain, Steven Smith, Lady [Kathy] Smith, Shelley Chernin, John Burroughs and Steve Brightman. This book is our biggest yet, 300+ pages, featuring 217 poems (31 by each author), all written in response to the editor's October 2013 poem-a-day challenge. [He borrowed the idea from a poem-a-day book called February 03 by Todd Colby, Alex Gildzen, Thurston Moore and Matthew Wascovich (published in 2003 by Slow Toe in Cleveland).] Oct Tongue -1 is a 6x9" paperback, ISBN 978-1-940996-08-0, available for $15 (now only $10) from Crisis Chronicles Press, 3344 W. 105th Street #4, Cleveland, Ohio 44111. See October through the eyes of seven fine and quite different poets! Please join us at these special launch events! Dr. Mary Weems is a poet, playwright, imagination-intellect theorist, social/cultural foundations scholar and former Poet Laureate of Cleveland Heights. Weems is the author and/or editor of twelve books and five chapbooks, most notably white (Wick Poetry Chapbook Series) and Tampon Class (Pavement Saw Press). Two of her books were full collections of poetry: An Unmistakable Shade of Red and the Obama Chronicles (Bottom Dog Press, 2008) and For(e)closure (Main Street Rag Press, 2012), both finalists for Ohioana Book awards. John Swain of Louisville, Kentucky, is the author of several acclaimed books including Rain and Gravestones (2013, Crisis Chronicles), White Vases (2012, Crisis Chronicles) and Prominences (2011, Flutter Press). His latest, Ring the Sycamore Sky, is forthcoming in the summer of 2014 from Red Paint Hill Publishing. Steven B. Smith was born, is living, will die. He's been a poet 50 years, artist 49 years, the publisher of ArtCrimes, editor of AgentOfChaos.com, he blogs on WalkingThinIce.com, and sings at ReverbNation.com/MutantSmith. Smith & Lady published his bio Stations of the Lost & Found, a True Tale of Armed Robbery, Stolen Cars, Outsider Art, Mutant Poetry, Underground Publishing, Robbing the Cradle, and Leaving the Country in 2012 via The City Poetry Press. Lady, a.k.a. Kathy Ireland Smith, is a poet, publisher, artist and surreal photographer from northeast Ohio. She and her husband Smith spent 31 months of traveling in 10 countries on 3 continents from 2006-9, and you can follow their ongoing adventures at WalkingThinIce.com. Kathy is also founder and editor of The City Poetry (thecitypoetry.com), a cutting edge art and poetry zine based in Cleveland. Shelley Chernin is a freelance researcher, writer and editor of legal reference books and a ukulele enthusiast. Her poems have appeared in places like Great Lakes Review, Scrivener Creative Review, Rhapsoidia, Durable Goods, Big Bridge, and the Heights Observer. She was awarded 2nd Place in the 2011 Hessler Street Fair Poetry Contest. Her chapbook, The Vigil, was published in 2012 by Crisis Chronicles. Steve Brightman lives in Kent, Ohio. He firmly believes in two seasons: winter and baseball. His most recent chapbooks include 13 Ways of Looking at Lou Reed (2013, Crisis Chronicles Press), In Brilliant Explosions Alone (2013, NightBallet Press); Like Michelangelo Sorta Said (2013, The Poet’s Haven), Absent The (2013, Writing Knights Press) and Sometimes, Illinois (2011, NightBallet). John Burroughs is the founding editor of Crisis Chronicles Press and hosts the Monday at Mahall’s Poetry and Prose Series in Lakewood, Ohio. He is the author of It Takes More Than Chance to Make Change (2013, The Poet’s Haven), The Eater of the Absurd (2012, NightBallet Press), Barry Merry Baloney (2012, Spare Change Press), Water Works (2012, recycled karma press), Electric Company (2011, Writing Knights) and more. This is one of those mornings I wish I could follow Andy's advice. I used to be able to. 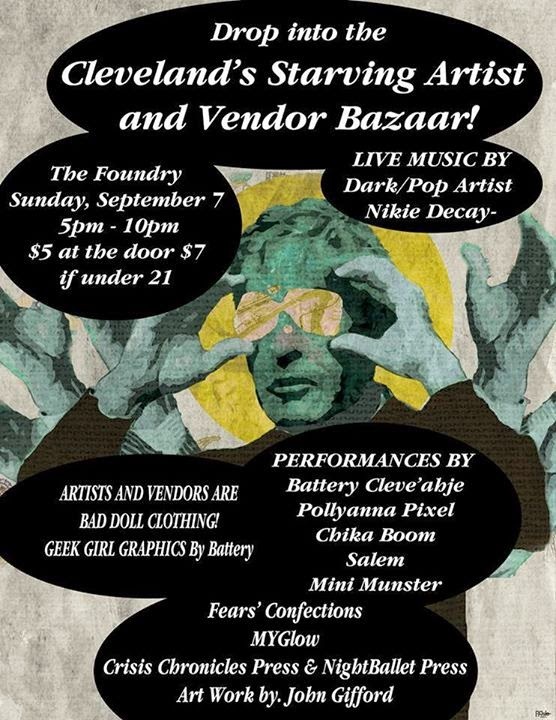 Crisis Chronicles Press is participating in this special event September 7th at the Foundry Club in Lakewood. Join us for food, art, clothing, books, live entertainment and more at Cleveland's Starving Artist and Vendor Bazaar! We don't do this for the money, obviously, though it would be nice to break even. Crisis Chronicles Press has received $2869.46 in receipts (sales and donations) so far this year. Pretty good. This number includes more than just CC Press titles, however. It includes what I've received selling any books at all: (1) ones I've published through the press, (2) copies of chapbooks I've written (published by other presses) that I've sold myself, and (3) books I've bought cheap here and there and resold in the Amazon marketplace. So $2869.46 came in from all that. How much of this have I spent to produce and distribute Crisis Chronicles Press titles in the same period? I've spent $3263.66, mostly on ink, printing and mailing. So the press has lost a mere $394.20 this year. Not so bad for doing something I mostly love, right? Now compare this to last year, when we received $7650.40 and spent $7943.21 to lose $292.81. Part of this is because I'm a bad businessman. I give away more books than I sell. (I also buy more books than I sell.) But whatever the reason, this is not a model of sustainability. What to do? I don't know. I'm just talking aloud, partly because someone recently accused me of making a fortune off poetry with my "ersatz" press. I laughed and got angry at the same time. I'm proud of what the press does. But like I said, it isn't for the money. If you'd like to help us break even, please consider buying a book or making a small donation. And many thanks to the people who have done so faithfully since I started this project back in 2008. Much love to you!